A spin is now apparent under a burst of deep convection centered near 14 N / 120 W or about 890 miles southwest of Cabo San Lucas. 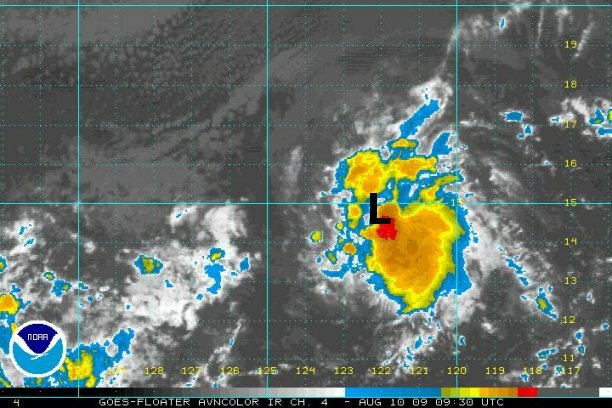 Earlier this was displayed as a sharp tropical wave on the Quickscat satellite. 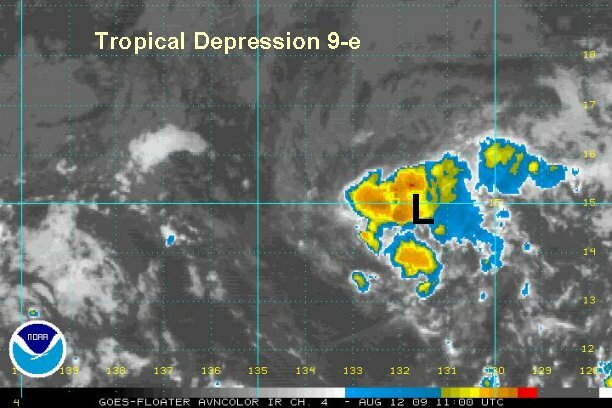 We now think that there is enough evidence to classify this as a tropical depression. It is moving west at about 8 mph. This system is NOT a threat to Mexico. 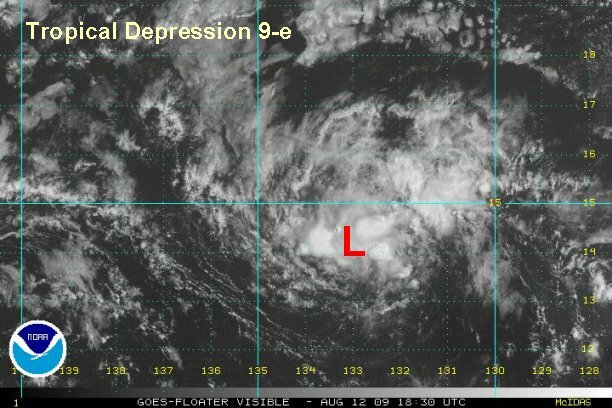 After a very impressive burst, tropical depression 9-e lost most of its convection. Over the past couple of hours a new round of convection has started. It is centered near 13.9° N / 120.6° or about 925 miles southwest of Cabo San Lucas, Mexico. It is moving west at about 7 mph. 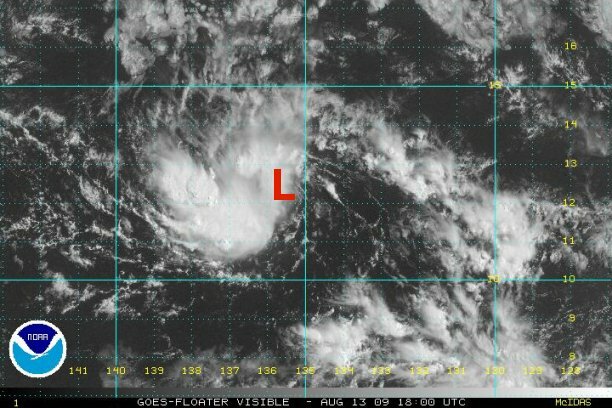 The depression has held onto deep convection, but still is fighting wind shear. The overall appearance has not changed over the last several hours. If the shear weakens a touch 9-e will become Guillermo. It is centered near 14.9° N / 122.1° or about 970 miles southwest of Cabo San Lucas, Mexico. Top sustained winds are still estimated at 35 mph. It is moving west at about 8 mph. Fairly impressive convection continues on the southeast side of the circulation of the depression. With the help of visible satellite imagery, the center now is clearly visible and is very tiny. It's still not quite at tropical storm strength yet. 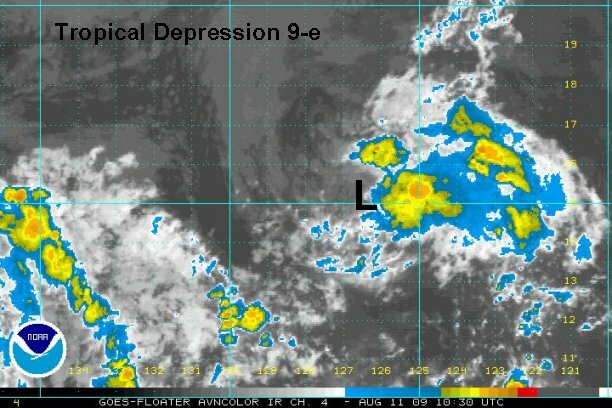 As of 1:30 pm edt / 10:30 am pdt the depression is centered near 14.9° N / 123.9° or about 1060 miles west southwest of Cabo San Lucas, Mexico. Top sustained winds are still estimated at 35 mph. It is moving west at about 9 mph. 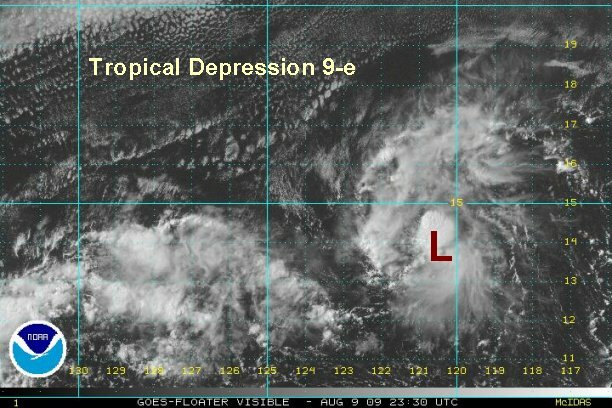 Tropical depression 9-e is in no hurry to develop. It is still fighting westerly wind shear. Deep convection is hanging on, on the eastern side of the circulation. We still believe that the shear will weaken enough for this to become a tropical storm in the next day or two. As of 7:30 am edt / 4:30 am pdt the depression is centered near 15.1° N / 126.5° or about 1195 miles west southwest of Cabo San Lucas, Mexico. Top sustained winds are still estimated at 35 mph. It is moving west at about 13 mph. 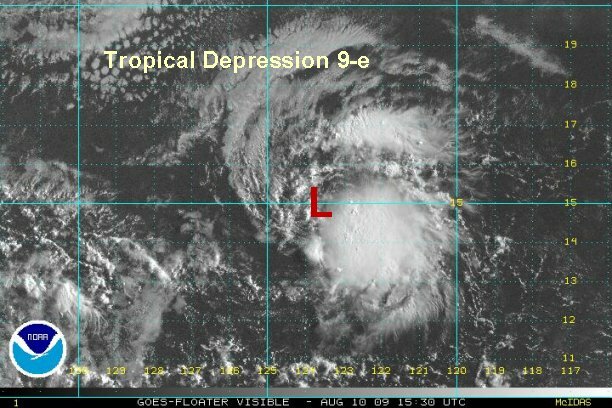 Tropical depression 9-e continues to hold a little below tropical storm strength. Just when convection starts to build, it soon collapses and weakens. Over the past few hours a new round of scattered convection is building near the center. We'll see if it can actually hold on this time. As of 8:00 am edt / 5:00 am pdt / 2:00 am hst the depression is centered near 14.7° N / 131.7° or about 1525 miles west southwest of Cabo San Lucas, Mexico / 1580 miles east southeast of Hilo, Hawaii. Top sustained winds are still estimated at 35 mph. It is moving west at about 13 mph. There has been overall little change today. 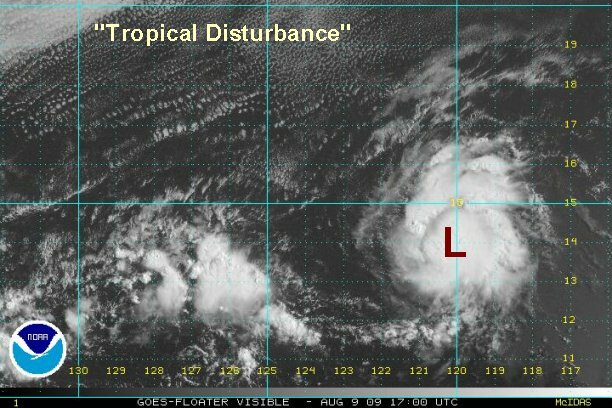 The tropical depression appears to be moving south of due west now. It also still looks like the mid level and low level circulation are still not co-located. This indicates that it is still not quite organized yet. We expect a more west southwest course to take over as a high builds north. 9-e is still expected to become a tropical storm. As of 3:00 pm edt / 12:00 pm pdt / 9:00 am hst the depression is centered near 14.1° N / 132.9° or about 1610 miles west southwest of Cabo San Lucas, Mexico / 1515 miles east southeast of Hilo, Hawaii. Top sustained winds are still estimated at 35 mph. It is moving west southwest at about 14 mph. 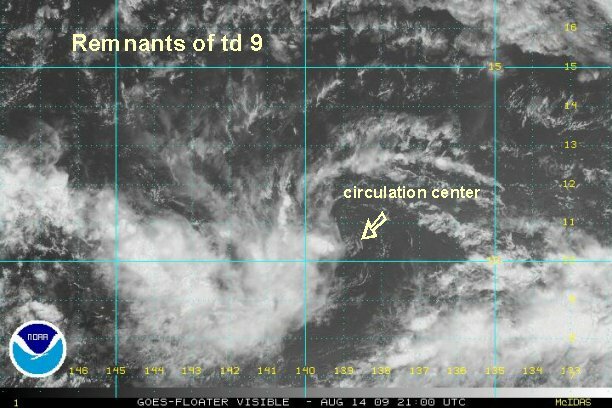 The weakening trend has continued and we're beginning to wonder if td 9 will ever develop. The low is now broad and diffuse with little convection. As of 10:00 pm edt / 7:00 pm pdt / 4:00 pm hst the depression is centered near 13.8° N / 134.4° or about 1715 miles west southwest of Cabo San Lucas, Mexico / 1425 miles east southeast of Hilo, Hawaii. Top sustained winds are estimated at 30 mph. It is moving west southwest at about 14 mph. 9-e has weakened. This will be the last update unless regeneration occurs. 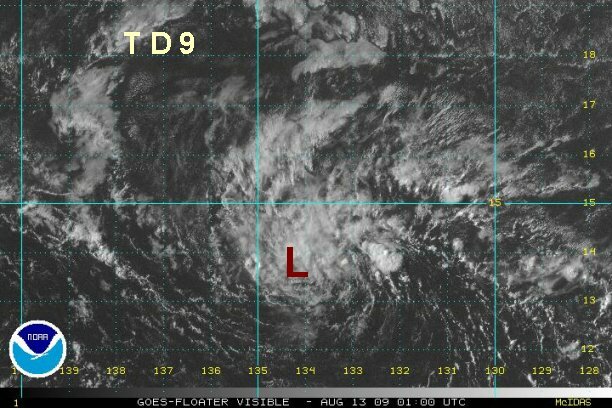 Just after esssentially writing tropical depression 9-e off, it is now making a comeback. Deep convection is building on the west side of the circulation. The east side remains weak and top sustained winds are estimated near 10 mph. As of 3:00 pm edt / 12:00 pm pdt / 9:00 am hst the depression is centered near 12° N / 136 W° or about 1800 miles west southwest of Cabo San Lucas, Mexico / 1435 miles east southeast of Hilo, Hawaii. Top sustained winds are estimated at 30 mph. It is moving west southwest at about 14 mph. Visible satellite imagery show that the circulation center is now very diffuse. This will be the last update.